Picture this: you arrive home after a long day at work, picking up the kids at school, dropping the kids at soccer, picking up groceries and then the kids again. The only thing you want to do when you get home is fall into the soft surface that is your sofa and turn on the television. But you can’t because the sofa, as well as every other surface of your home, is covered in stuff. Bags, used coffee cups, this morning’s breakfast dishes, clean laundry that needs folding and so on and so on. Surveying the mess that covers every surface, you feel what was left of your good humour ebb away. It’s time to act. 1. Everything has it’s place at the front entrance (and everywhere else in the house). When you walk in the door, you and the rest of your family should know where everything goes and none of those places should be a flat surface! Get rid of the hall table and put a basket on the wall for mail, hooks for keys, space for purses, hangers for scarves, jackets and storage bins for mittens and hats. There are so many little ways you can find space for everything without using tables and chairs. 3. Keep kitchen counters as clear as possible. The only appliances you should leave out are the things you use every single day. In our case, it’s the coffee maker, cutting board and toaster. Beyond that, small appliances can be put away within functional reach. If you don’t use the hand blender everyday, does it need to be cluttering up the counter top? Never touch that bean grinder that your mother-in-law bought? Put it away. Tip: bring it back out when she comes to visit. That’s just good advice! 4. Soft surfaces are clutter magnets too. Tossing the sweater you wore on a chair because you’re planning on wearing it again tomorrow? Not anymore! Set up a once-worn bin in your bedroom to put all things that are clean enough to wear again before they hit the laundry basket. Save your chairs for sitting. Spend a little time figuring out what things need homes and get going with a new habit of putting them away immediately. After a while, you won’t even know you’re doing it, but you’ll be able to sit on a chair or make a cup of coffee without moving piles of things out of the way first. It’s the first step to bringing back your good humour. For more info about organizing, check out my 31 Days of Decluttering, Organizing Your Home on a Budget series and 30 Days to a Clean & Organized Kitchen. You might also like how to keep clutter off your counters. 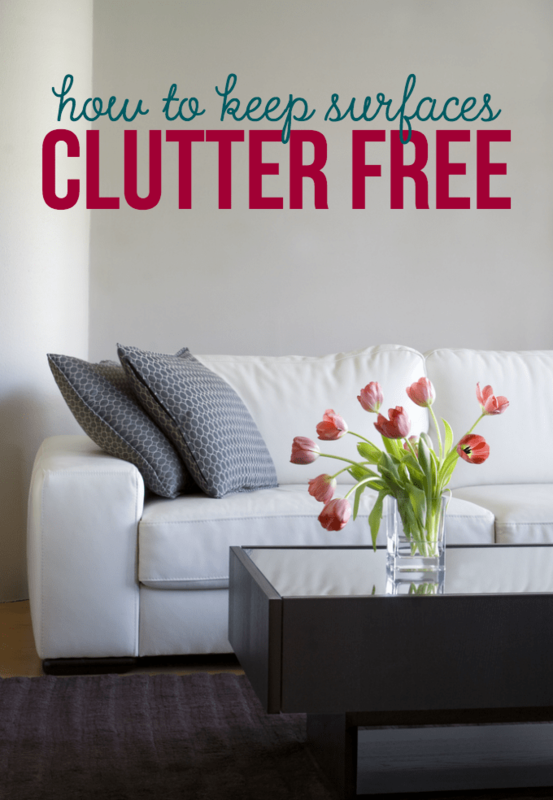 Do you have an issue with surface clutter in your home? In my home it’s really a lack of space (cupboards etc) that causes the clutter and of course my son causes 90% and he’s an adult. His stuff is everywhere and I am totally fed up of clearing it all away. Talking to him seems to do no good at all, so I’ve stopped washing up for him, clearing the drying rack, emptying the dishwasher for him, that however doesn’t seem to work either. I am totally fed up with it! This seems to be a trend these sort of tips, I’ve definitely learned a lot more from this blog than others though. thanks for posting I will try this when I move home as where I am currently is WAY too small to even consider this. I know that it’s difficult to not have clutter with kids, but I find people have a lot of stuff… Kids have a lot of “stuff” they do not really need. Thank you for the tips, they’re great! I am so guilty about using the kitchen table as a dumping ground. My table is very big and I use it to keep a lot of stuff on it. I am working right now to get the clutter off the table and keep it off. Thanks for these tips! I do have a problem with clutter in my home but, after reading this post, I am encouraged to begin some new de-cluttering habits. Thank you for all you tips. They are sensible and workable. All it takes is persistence until it becomes a good habit. Thank you and I plan on reading the other posts on this topic. I agree with your solution to the problem. Getting the rest of the family to follow suit is the challenging part, especially when they’re adults. Uncluttering my home is a goal but your words of encouragement gives me extra drive to follow through. Thanks, and have a great day! Well, I have started decluttering in my kitchen and I am so happy that I have done so. It is easier than I thought it would be. I still have a long way to go but i will continue on, reading your tips over and over. Thank you so much.